It isn’t a party without finger foods. 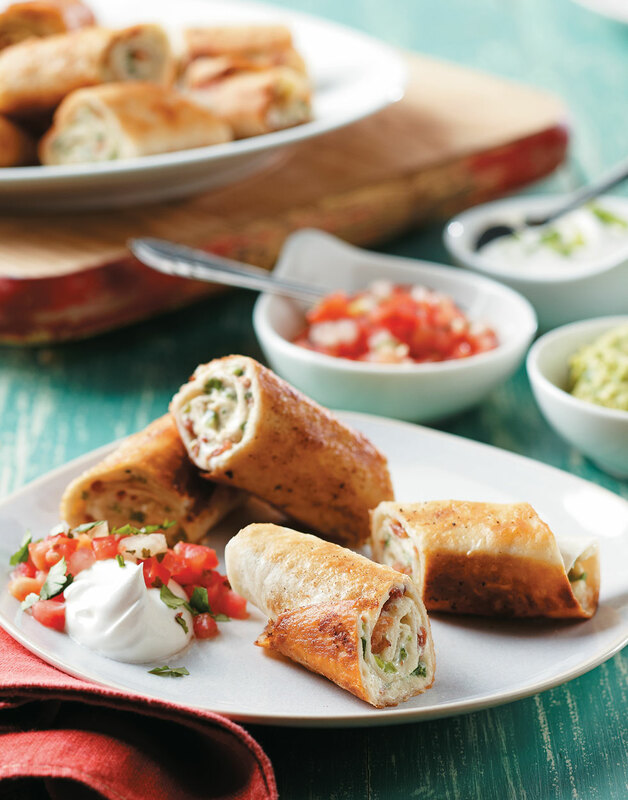 These roll-ups are perfect as appetizers to kick things off or served on the side. If you're having more than a small gathering, this recipe is easy to double. Just be sure to fry the roll-ups in batches so they're crisp, not soggy. Cook bacon in a sauté pan until crisp; transfer to a paper-towel-lined plate. Reserve drippings in sauté pan. Blend cream cheese, jalapeño, Jack cheese, scallions, cumin, coriander, and bacon in a bowl with a mixer on medium speed; season with salt and pepper. Spread about ¼ cup cream cheese mixture on one side of each tortilla all the way to the edges. Roll up tortillas and fry, seam side down, in batches, in sauté pan with drippings, over medium heat until browned, about 5 minutes. Slice tortillas into thirds; serve with pico de gallo or guacamole.